Visit Chuck E Cheese’s with your entire family for a fun-filled day you will always remember. We have something for everyone. We offer children an environment where a kid can be a kid! 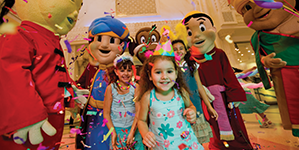 Whether it’s family fun, games, delicious food, or peace of mind, this is the right place to be in Dubai. Let your children enjoy our video and arcade games or make their birthday memorable by celebrating in our festive ambience.